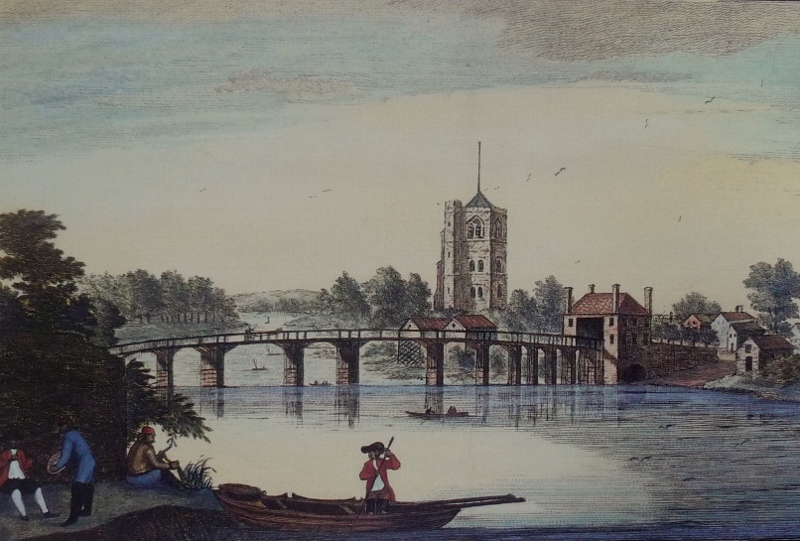 The Panorama of the Thames project will show the changes in the banks of the River Thames from Richmond to Westminster over the years since 1829. The authors have made a careful digital restoration of the 60 foot long panorama published by London bookseller Samuel Leigh (1780-1831) in 1829. This depicts 15 miles of the river upstream of Westminster at the end of the reign of George IV. They have annotated it with information about the waterway, landscape, buildings and people who lived and worked on the banks of the river at the end of the Georgian era. The home page gives you the option of looking at the Georgian or the Current views. The contemporary panoramas are being published in phases and the first section was uploaded to the internet on 22 September 2014. Contemporary Hammersmith is already online. There are two sets of photographs, one black and white set commissioned by Hammersmith Library and taken by Fox Photos Ltd on 16 June 1958, the other taken in 2014 especially for the project. Fulham is not yet there. 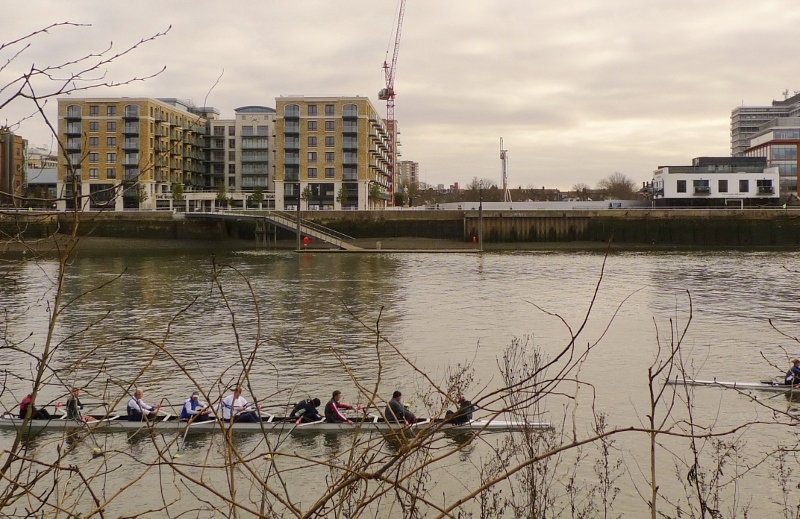 The Georgian river is online but funding is needed before a contemporary Fulham panorama can be created. 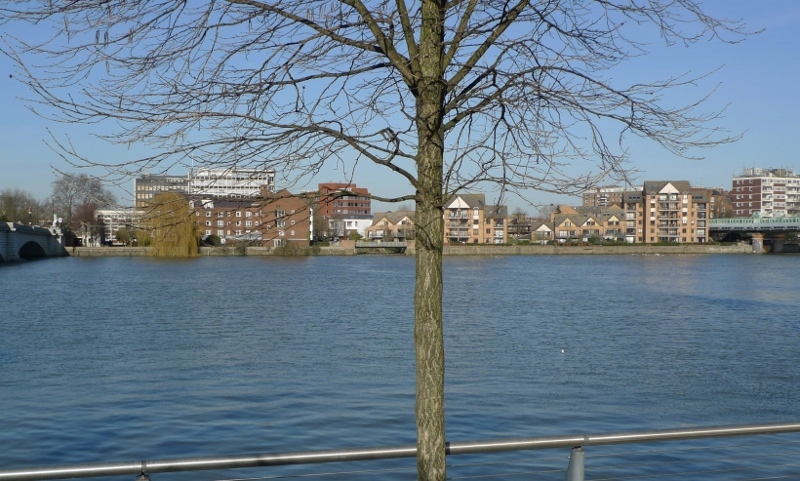 I looked in the Archives to see if I could find pictures to show the changes to the Fulham riverside that had taken place in the early 1800s, around 1900 and the present day. 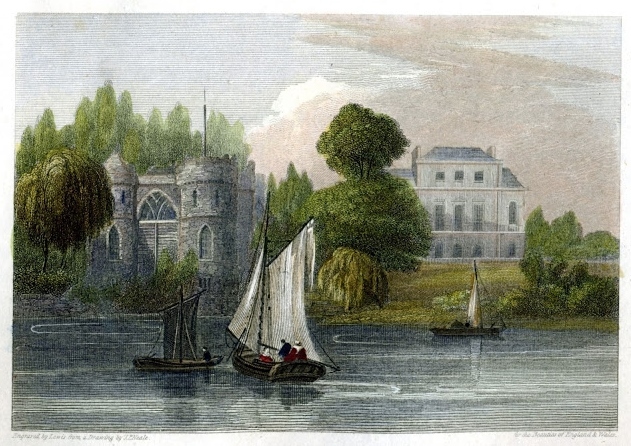 In 1829 Fulham’s riverside was fringed by meadows and market gardens with some fine villas and country cottages. Industry arrived and took over much of the riverside in the late 1800s. Little of this remained by 2000 and today the river is dominated by large residential blocks of flats. I have written before about Brandenburgh House, “a splendid seventeenth century mansion overlooking the Thames”, where Queen Caroline, the wife of King George IV lived for the last two years of her life. She died there in August 1821. Queen Caroline was the last resident of Brandenburgh House. In 1822 the property was sold and the house demolished. On the site was built the first and largest of the industrial development schemes that were soon to stretch right along the river in Fulham. The Haig Distillery was erected in 1857 on part of the former grounds and in 1872 Alexander Manbre built his sugar refinery on the remainder of the site. Nowadays the St George’s Group occupies the area and is building Fulham Reach, an enormous development of apartments already half completed and due to be finished by 2022. The changes at Putney Bridge are less marked. The area became far busier during the nineteenth century and a concrete new bridge, Putney Bridge, was built 1884-86. 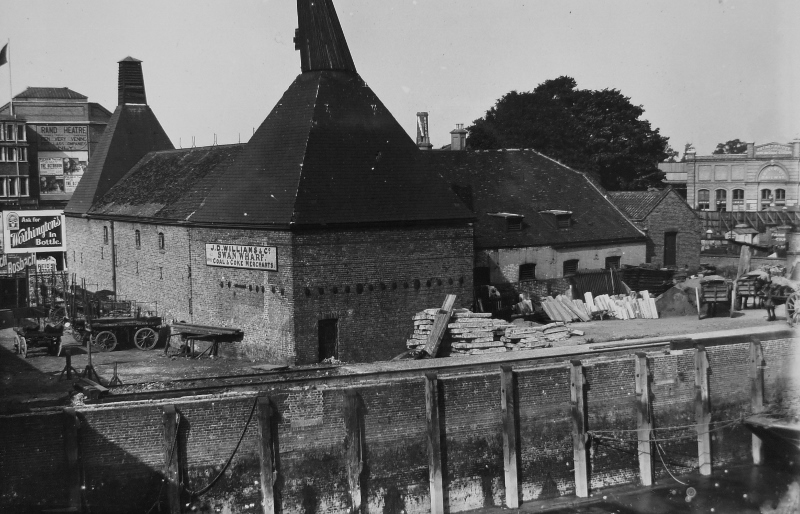 In this photograph you can see the bridge under construction, the malt houses, the corner of the toll house and the beginnings of the housing boom behind. By 1904, you could stand on Putney Bridge, look along the bank and see the tube station in the far right corner of this photograph. Willow Bank had been bought by the District Railway Company in 1889 and demolished soon after to make way for the extension of the railway across the river to Putney and Wimbledon. 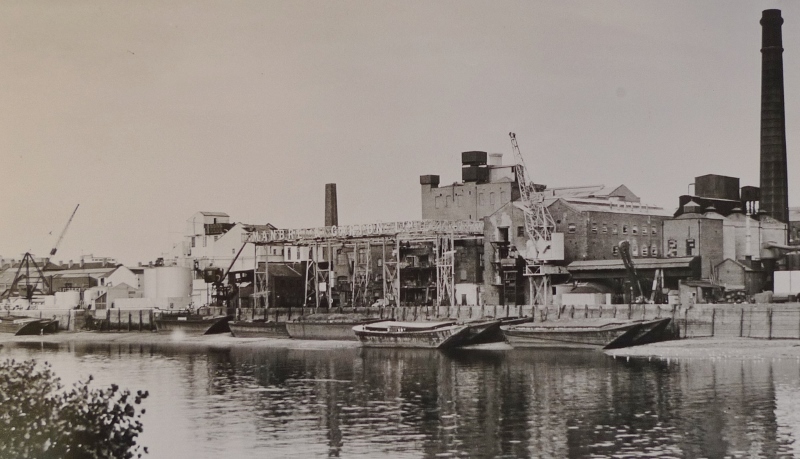 The site eventually became a marble and granite works operating from Willowbank Wharf. 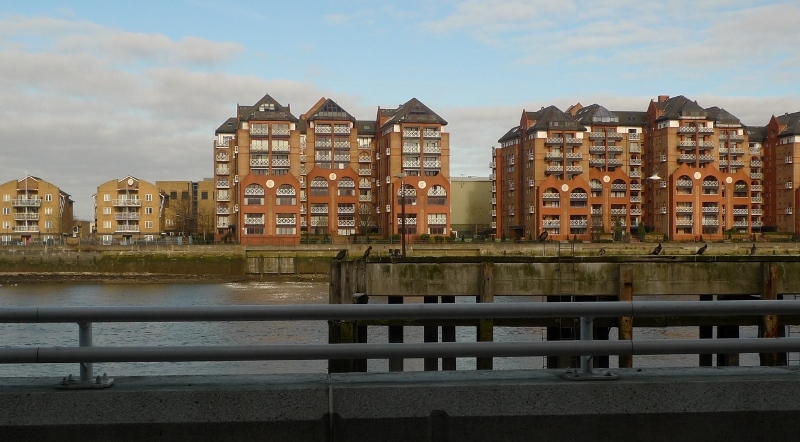 Nowadays the old building are gone but they are remembered in local names so looking at the photograph below, Putney Bridge is on the far left, the sheltered housing of Swanbank Court on Willow Bank is next to it, then comes the Swan draw dock with a footbridge crossing it (the old Fulham Bridge ran along the west side) and the modern flats at Carrara Wharf built when Willowbank Wharf was sold in 1983. My third example is Sands End and Fulham Power Station. In 1829 Town Meadows, the area bordering the river in Sands End, was liable to flooding, dissected by creeks and used for grazing. There are no pictures in the Archives, the 1829 Panorama shows nothing but tufts of grass and the earliest maps merely show marshland. The land was gradually developed in the 1890s taking advantage of the river frontage for deliveries of raw materials by river, particularly coal. 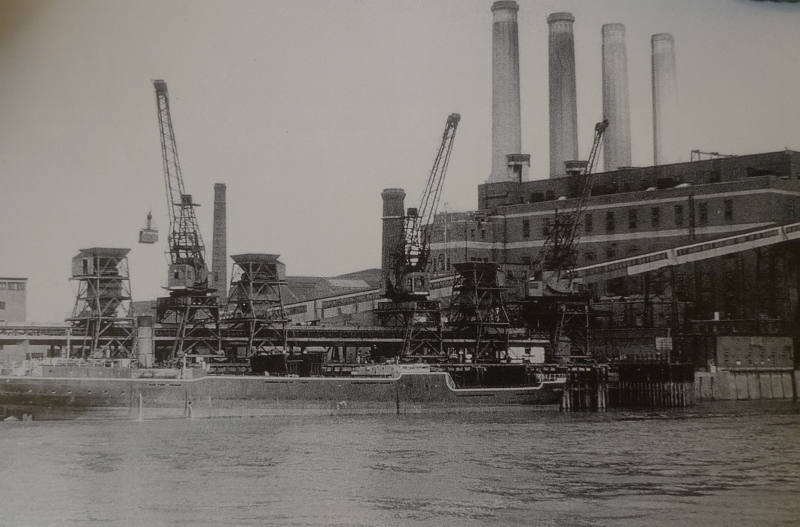 The original Fulham power station was built in 1897 by Fulham Borough Council and a public supply of electricity was first made available in 1901. It was rebuilt in 1936. The Power Station was decommissioned in 1978 and demolished in the 1980s when it was decided there was no longer a place for coal burning power stations. The decline of traditional industries and uses led to the dereliction and clearance of many sites along the river at that time. On the site of the power station was built the Harbour Club and the Sands Wharf development. In the photograph below the Harbour Club can just be seen between the residential apartments at Regent on the River. Their design was said to reflect the scale and massing of the main building of the former Fulham Power Station, the site of which they stand on. To the left is part of the affordable housing, Watermeadow Court, currently standing empty. This entry was posted in Archives & local studies, Hammersmith Library and tagged archives, Brandenburgh House, Fulham, Fulham Reach, Georgian, history, local history, local studies, panorama, power station, Putney, Putney Bridge, river, Sands End, Swan Inn, Thames, Willow Bank, Willowbank Wharf. Bookmark the permalink.